Prenatals that seem vegan but are not. Even if packaging says “Dairy-Free,” “Egg-Free,” or “Gelatin-Free,” there may still be hidden animal ingredients in things like Vitamin D, or the capsule materials itself. Brands that many people think are vegan but are not or most of the time are not are New Chapter, Rainbow Light, and Nature’s Way Alive. 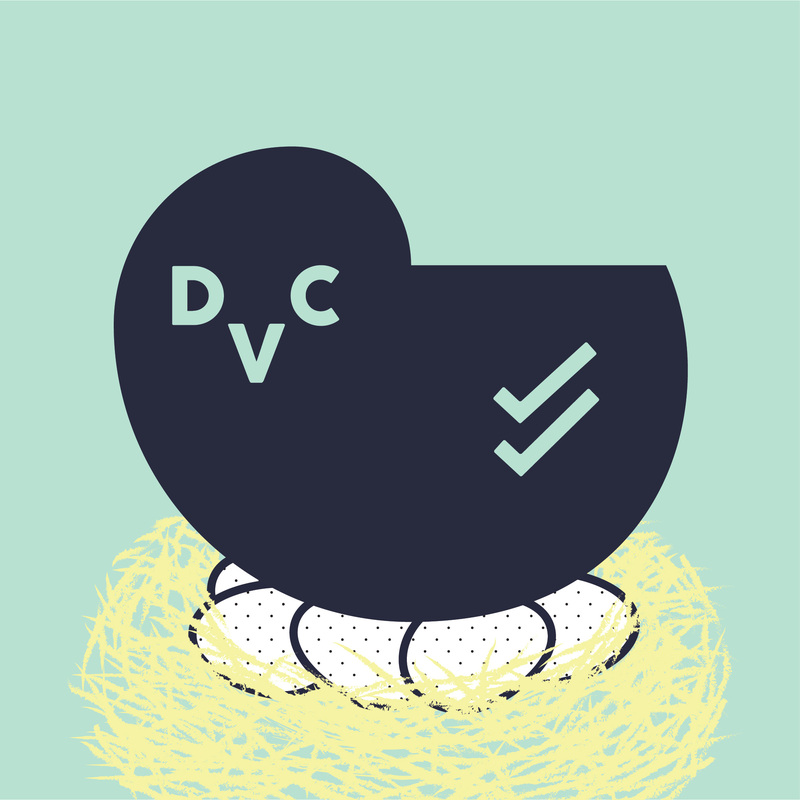 New Chapter‘s prenatal uses Vitamin D sourced from sheep and the coating resin is sourced from lac beetles. Rainbow Light makes many prenatal vitamins but their only vegan prenatal is Precious Gems Gummies. Nature’s Way Alive makes several prenatals but their only current vegan one is Alive! Complete Prenatal Multi. Their similarly named Alive! Prenatal Multi-Vitamin with Plant DHA is not vegan. 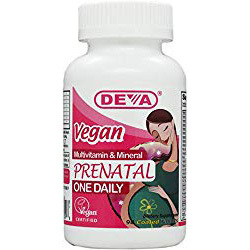 The least expensive vegan prenatal vitamin on our list is made by DEVA Nutrition. The rest cost significantly more. According to the Centers for Disease Control and Prevention, folic acid taken during pregnancy greatly reduces a baby’s risk of developing neural tube defects. However, people with certain mutations of the methylenetetrahydrofolate reductase (MTHR) gene may have difficulty processing folate and folic acid. Ask your healthcare professional if they recommend a particular form of folate or folic acid. Also, if you’ve joined 23andMe, the website Genetic Lifehacks has great instructions for checking your DNA results yourself to find out if you have the MTHR mutations. Some prenatal vitamins contain Calcium, Iron, and/or Omega 3s like DHA and EPA, but many don’t. I’ve noted this information for each vegan prenatal listed below. Ask your healthcare professional if they recommend taking additional supplements. You can also look for vegan foods high in these nutrients. Not everyone is good at swallowing giant pills. If you have trouble getting a big pill down, consider gummy vitamins like Garden of Life’s Prenatal Whole Food Gummies, or Rainbow Light Prenatal Precious Gems. If gummies aren’t for you, try something like Naturelo’s Prenatal Multivitamin, which is divided into three pills/day instead of one giant one. Vitamins may cause even more nausea for those who have morning sickness. Iron is one known culprit. 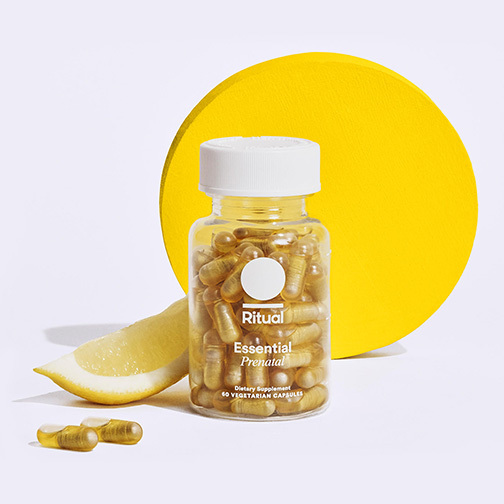 RITUAL is the only prenatal vitamin listed below that advertises itself as using ingredients to help avoid nausea. Some vegan prenatal vitamins are more allergen-friendly than others. I have noted any certifications, like gluten-free, in the list below. There has been a lot of debate over which is a better source of Vitamin B12 – Methylcobalamin or Cyanocobalamin. Methylcobalamin is a naturally occurring form of B12, and Cyanocobalamin is synthetic. Looking at the few studies done so far, it’s not yet clear if one is markedly better than the other. I have noted the source of B12 for each vegan prenatal supplement on the list below so you can choose for yourself. Source of Folate: Folate as 5MTHF Glucosamine Salt which may be more easily absorbed by people with MTHF gene mutations. Contains Iron, as Ferrous Bisglycinate which may be less likely to cause nausea than other sources of Iron. “No-nausea capsule design” that can be taken on an empty stomach. Non-GMO, Gluten-Free, No Colorants or Synthetic Fillers but no certifications. Available by subscription only. But it’s risk-free. Gluten-Free, Soy-Free, GMO-free, but no certifications. Certifications: Organic (USDA), Vegan (vegan.org), Kosher (Star-K), Gluten-Free (NSF), Non-GMO (Non-GMO Project). I think these taste delicious. They’re a little chalky, like a gummy version of Flintstones vitamins which I loved as a kid. And since you’re supposed to eat them with a meal, they help fulfill my after-meal sweets craving. According to reviews, people are divided on the taste. Garden of Life was recently bought by Nestle. Certifications: Organic (USDA), Vegan (vegan.org), Kosher (Star-K), Gluten-Free (GFCO), Non-GMO (Non-GMO Project). Some reviewers reported allergic reactions.